Good line up for the show with Jason Bonham’s Led Zeppelin Experience opening up, then Cheap Trick and finally Foreigner. So the above pictures were the only ones I got from this show, which in the long run didn’t matter much anyway as the show was kind of a flop. I guess every show can’t be amazingly fabulous and there has to be a dud at some point. This was certainly it. It started out bad as I rushed out of the house (after waking up late from a nap) and had just a half an hour to get to the venue (White River Amphitheater), which is exactly a half an hour away from my house (without traffic)… I was a little concerned as I was doing a VIP meet and Greet with Foreigner and was told in an email confirmaiton to NOT BE LATE or else I would miss portions of the backstage tour and possibly the meet and greet, so naturally I was stressed and ran out of the house without my cell phone or my camera. No way to take any pictures of the show. If it was’t for the single meet and greet band shot and a nice lady taking the other two and sending to me, I would’t have gotten any at all. The back stage tour and hours devours/ drinks were pretty good. The lead singer of Foreigner Kelly Hansen actually designed the food choices and it was prepared by the same caterer who supports the band on tour, so it was quite tasty…the only problem was it was raining that day (I think first day of rain in Seattle in over 70 straight days) and there wasn’t much cover. The meet and greet was pretty good too except wouldn’t you think that a meet and greet with the BAND would mean the whole band? Apparently Mick Jones (the only actual, original band member) was above meeting the fans and busy doing something else…not cool! From that point on, that was pretty much the end of the “pretty good” and start of the “not so cool”. The night went down hill from there. First off, my seat was about 4 and a half feet from the mammoth stage sub-woofer that was pounding every one of Jason Bonham’s bass kicks straight through my skin, bones and very soul. I felt the vibration of the speaker hit my jacket and blow my hair back with every beat. There was just no way I was going to be able to sit there, and me without ear plug I would have been deaf for sure. I took the opportunity to walk up to the back grass area and watch/ listen from the back. I returned to my seat for Cheap Trick, only to find out that Robin Zander (lead singer) was a no show…the excuse was something about having to go back to Florida due to hurricane Irma…strange that I would expect there’s no safer place from a Florida hurricane than the other side of the country, but oh well. They played a half baked show with numerous stand-in singers and couldn’t get off the stage fast enough as far as I was concerned. Foreigner came on pretty late and had a good stage show and sounded fine, but by then I was not in the concert mood any longer and only stayed for the first five or six songs. 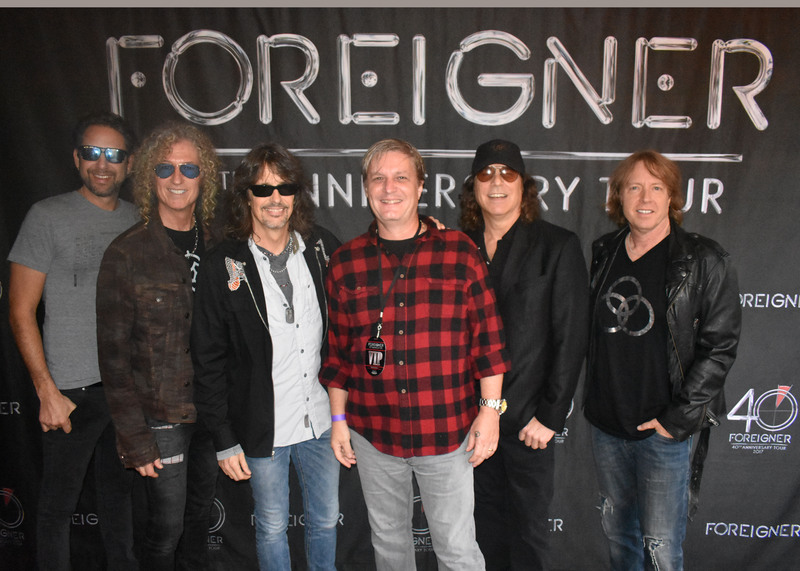 Pretty much a bust, except I got to meet (some) of the members of Foreigner and have some pretty tasty hors devours.